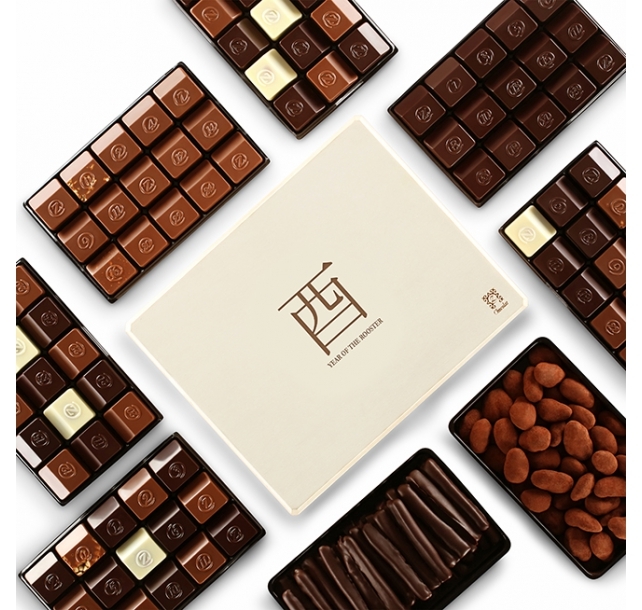 Description: A remarkable gift for an important client, a business partner or for a company team to share – our Chinese New Year Radiance is a veritable cornucopia of chocolate cheer – this generous offering is laden with a wide-ranging assortment of 168 of our finest French chocolates for the Year of the Rooster. Description: Whimsical heart-shaped morsels are drenched in colorful chocolate coatings to create our most romantic collection ever. Featuring four intriguing recipes, this assortment pairs classic flavors with fanciful exteriors. Rich hazelnut pralines take cover in creamy milk chocolate. Decadent dark ganache hides beneath an unassuming white surface. Vanilla bourbon caramels nestle inside smooth dark chocolate couverture. And a surprising bergamot-infused ganache rests under a daring red facade. A truly delectable way to declare your affections. 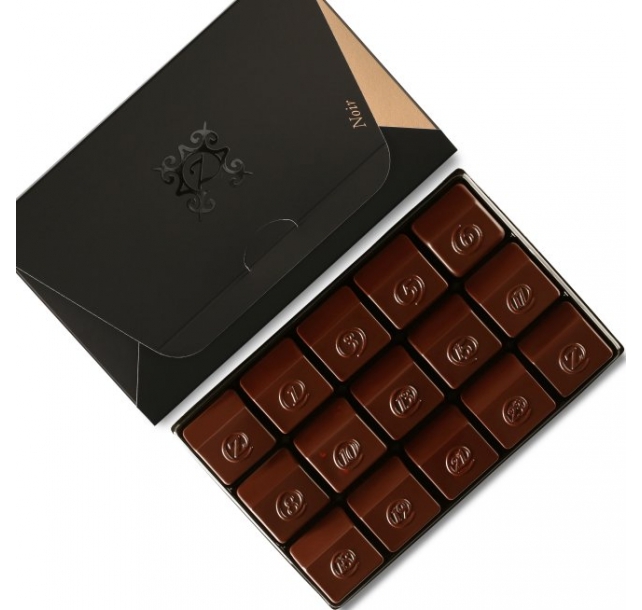 Description: Indulge your dark side with this assembly of zChocolat's most sophisticated pieces. 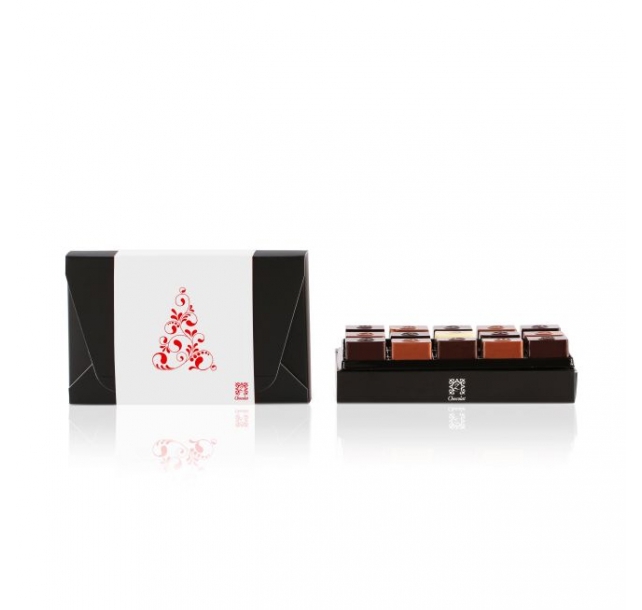 With fillings ranging from tangy passion fruit to sultry Kenyan coffee, each member of this assortment was included because of its silky 70% dark cocoa couverture. The resulting collection is at once robust and sensual, sure to be appreciated by dark chocolate aficionados everywhere. Read more details on dark chocolate in our blog. 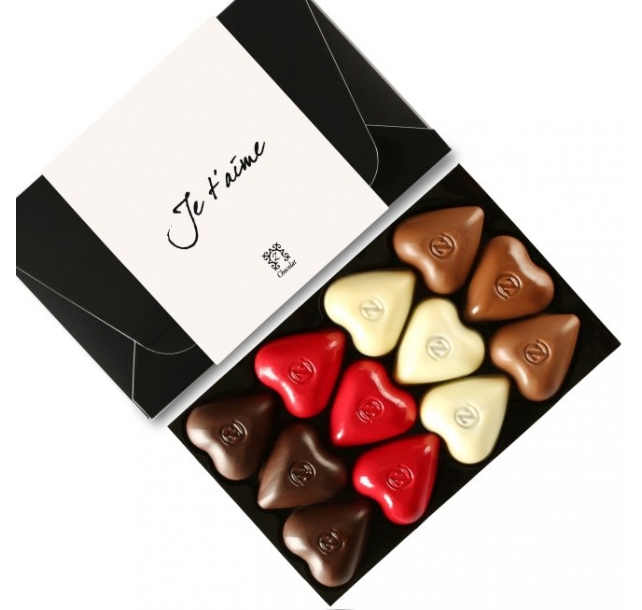 Description: This romantic assortment of 12 luscious heart-shaped chocolates will melt your recipient's heart instantly as it reveals the Toquade: a delicious dark ganache cloaked in a white exterior, the Suprême: a creamy milk hazelnut praliné, the Mystique: "fleur de sel" (salty) caramel infused with Bourbon Vanilla from Madagascar dressed in a dark couverture and the Amore: a divine bergamote-infused ganache hidden under a daring red robe. 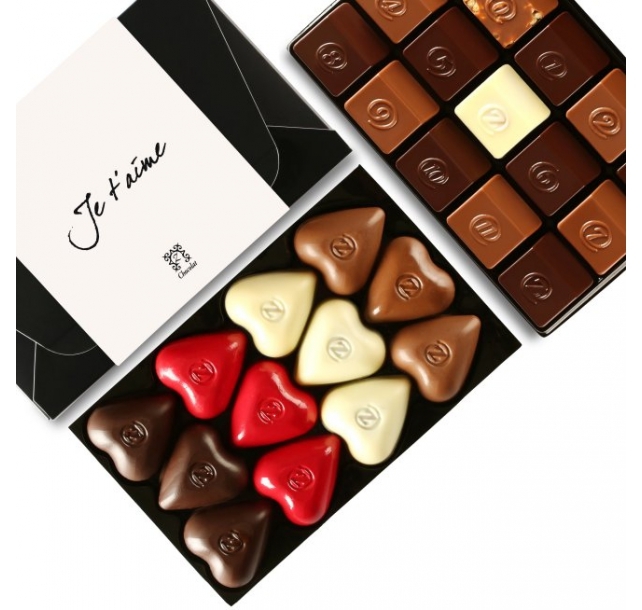 Description: The Classique is an assortment of time-honored flavor combinations prepared with a distinctive zChocolat touch. From a raspberry ganache covered in dark chocolate to a passion fruit caramel blanketed in milk chocolate, it’s a delicious way to experience the essential zChocolat recipes. 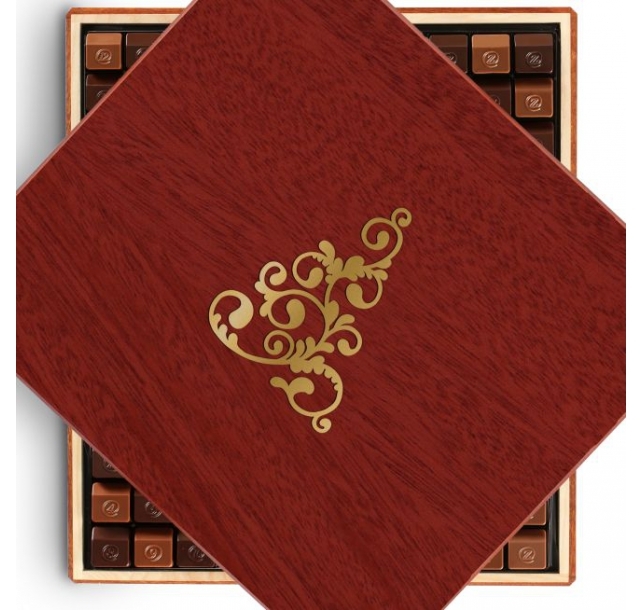 Includes pieces 0 to 11 from the Numbered Collection plus three of our legendary Z chocolates. Description: With ingredients from around the world, the Exotique assortment is a tantalizing tour of zChocolat’s most uniquely indulgent recipes. Flavors like coconut, lemon, rose, coriander, pistachio, sesame, and violet are expertly paired with classic French chocolate for a collection that is as unexpected as it is exceptional. Includes pieces 12 through 24 from the Numbered Collection, plus two white Z chocolates. Description: A smooth dark chocolate exterior gives way to reveal the pleasantly tangy center concealed in each of our Orangettes. 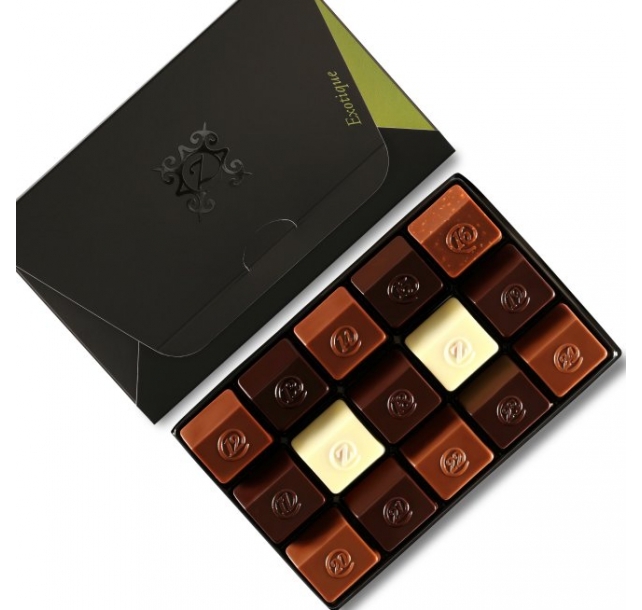 Made by gently simmering fresh Corsican orange peels in sugar water before submerging them in premium 70% Venezuelan chocolate, each bite is a remarkable combination of bright citrus flavor followed by a sweet rounded finish. A surefire way to earn a smile from someone special. Read more details on dark chocolate in our blog. 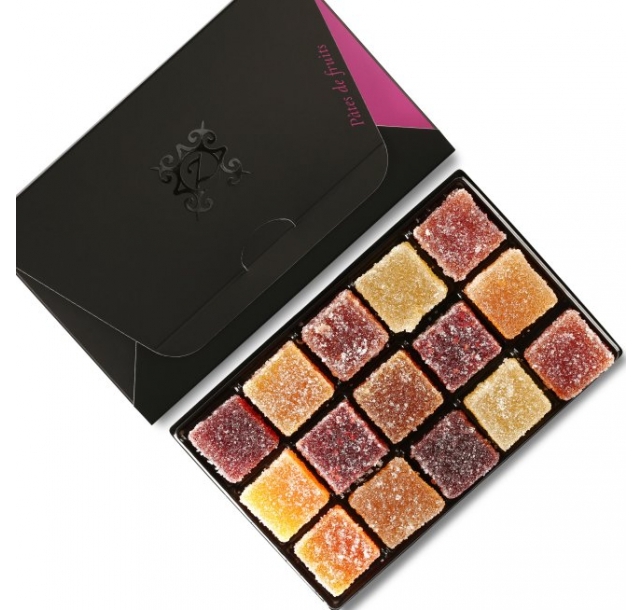 Description: With a jewel-like appearance and smooth, supple texture, one bite of our Pâtes de Fruits assortment will instantly transport you to the Provence countryside. Because each piece begins with fresh orchard fruit picked at the peak of sweetness, these candies nearly burst with natural cherry, lemon, apple, orange, strawberry, raspberry, and apricot flavors. A veritable rainbow of colors and ingredients, this charming assortment is a shortcut to sun-ripened bliss. Description: Prepared using local lavender honey and traditional techniques, each morsel in this assortment features tender and chewy white nougat studded with whole Provence almonds. The result is a heavenly confection destined to thrill anyone on your list. Description: Enjoy the renowned regional flavors of Aix-en-Provence with our world-class Calissons. Each bite incorporates a delicious blend of almond paste, orange zest, and candied cantaloupe, top coated with a delicate layer of white sugar icing for a treat that is irresistible. Description: The Personalized assortment gives you the option to handpick favorite chocolates to create your own dream collection. Individualize it even further by arranging the pieces to write-out a meaningful number such as a year, phone number, birth date, or even a secret code. Decadently delicious and intimately individualized, it's a thoughtful gift for someone who is truly one-of-a-kind. Description: Overwhelm your loved one with the best of both worlds: romance and traditional recipes. 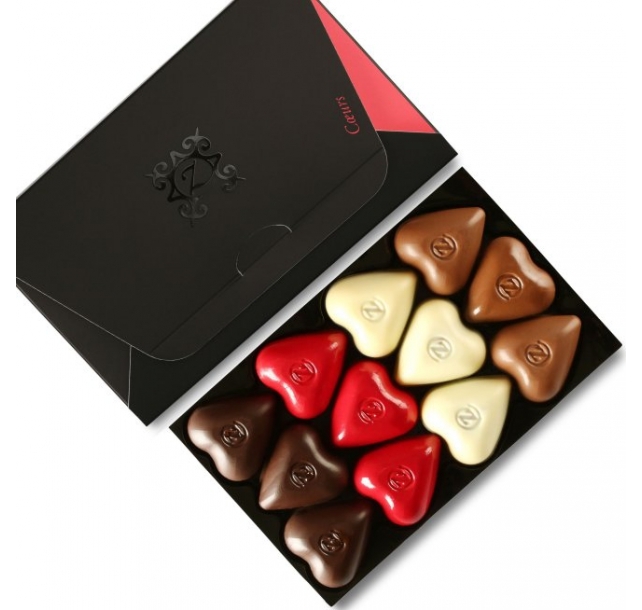 Our assortment of 12 heart-shaped chocolates reveals a dark ganache cloaked in a white exterior, a creamy milk hazelnut praliné, a dark couverture "fleur de sel" (salty) caramel infused with Bourbon Vanilla from Madagascar and a divine bergamote-infused ganache. 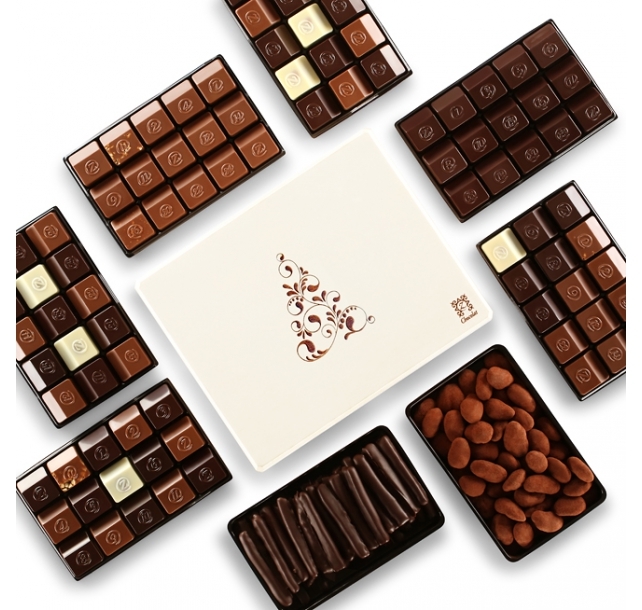 Our traditional assortment reveals our 15 most popular chocolates including 3 of our ever-famous Z pieces. 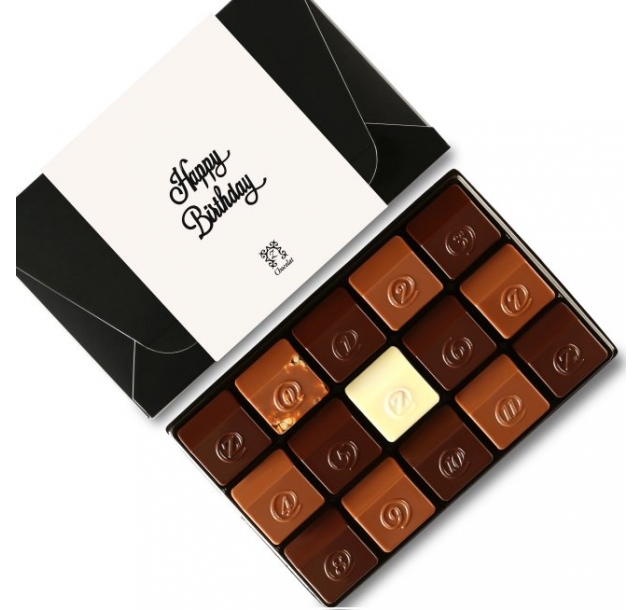 Description: Surprise your recipient for their birthday as this selection features our 15 most traditional chocolates including 3 of our ever-famous Z pieces: a combination of a crunchy praliné with sweet and salty caramel. Discover our other popular flavors such as a Venezuelan dark chocolate ganache, a gianduja and hazelnut praliné, a rich raspberry ganache, a passion fruit caramel or a vanilla ganache infused with lavender. 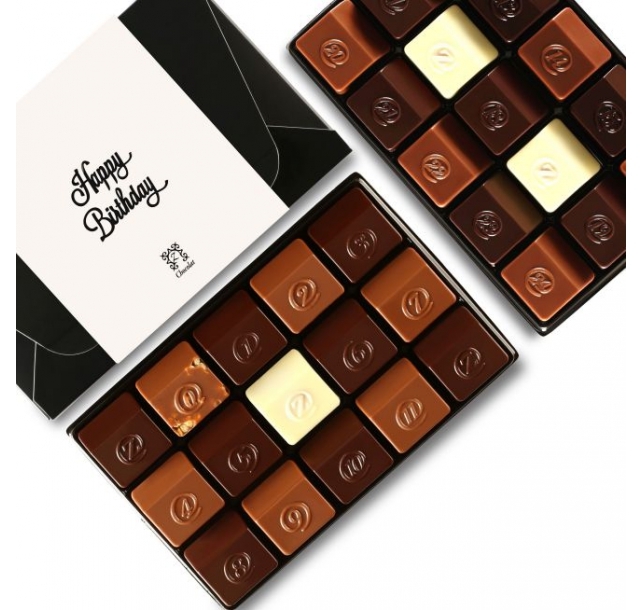 Description: Spice up the birthday bash with our entire Numbered Collection, composed of our 15 most traditional chocolates including 3 of our ever-famous Z pieces: a combination of a crunchy praliné with sweet and salty caramel – and our exotic assortment: a unique, gourmet selection of chocolates. Description: Transport their taste buds somewhere special this holiday season with our fifteen most-requested recipes. From an unforgettable Madagascar Bourbon vanilla ganache with just a touch of lavender, to an unparalleled lemon-almond paste wrapped in rich Venezuelan dark chocolate, each piece is pure serendipity for the senses. A delectable way to sample artisanal chocolate at its finest, our Holiday Assortment is perfect for party favors and exceptional as a stocking stuffer. 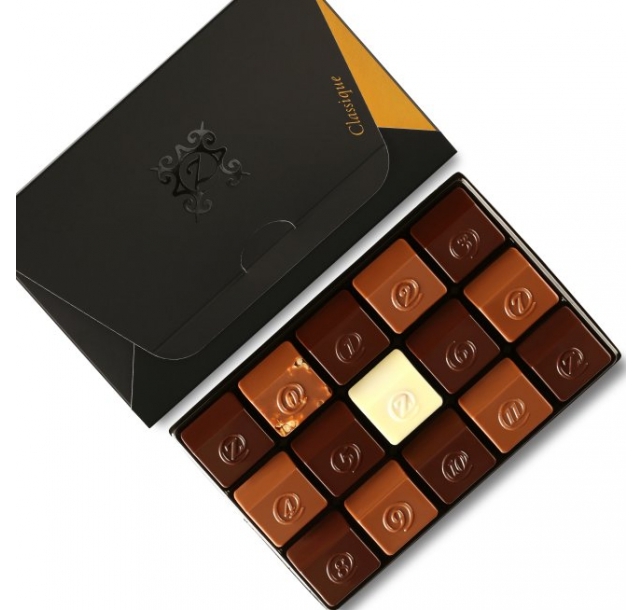 Description: As luminous as its name, the handcrafted Radiance is brimming with the best of zChocolat. Bursting with eight separate assortment boxes, you’ll enjoy every piece from the Numbered Collection, along with extras of our favorite recipes as well as samples of our most beloved candies such as the Chocomandines and Orangettes. An eye-catching festival of flavors for any true fan of fine chocolate. Description: Our grandest gift box yet ! Wow your recipient for a very special occasion with this stunning mahogany box containing our entire assortment collection. 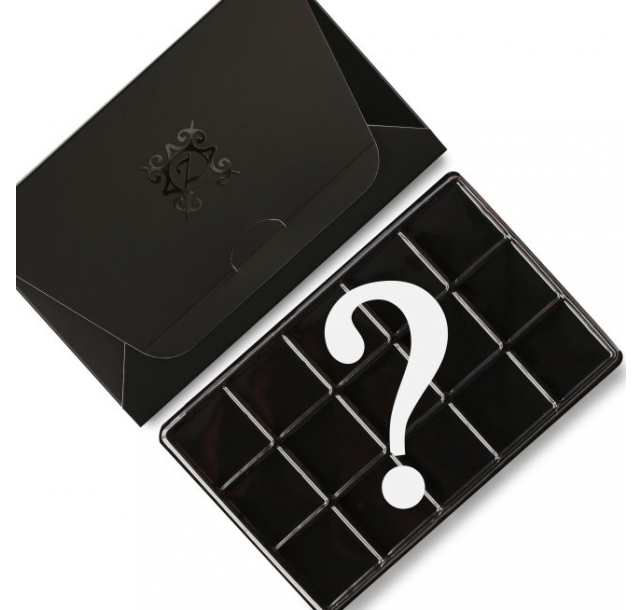 Description: Redefine indulgence with the unapologetically astounding Zeus box. 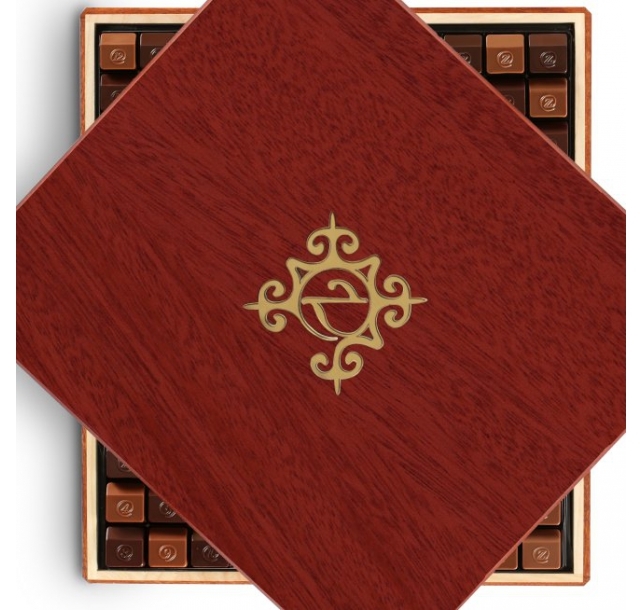 Featuring the entire Assortment Collection packaged in an oversized mahogany box, the Zeus box is an all-inclusive foray into fine French chocolate and the perfect solution for sharing with large groups of family and friends this holiday season. 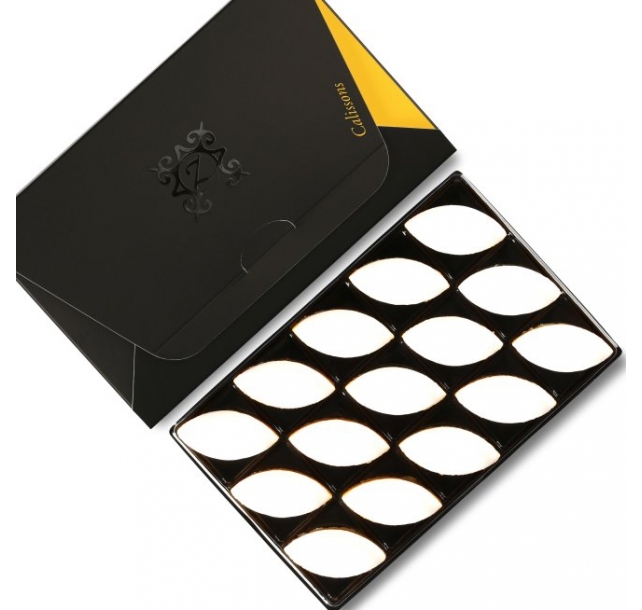 Description: Celebrate the season of light with a box that lives up to its name. A comprehensive invitation to experience fine French chocolate indulgence, the Radiance box features an incredible 168 pieces of our most-requested recipes packaged together in a beautiful basswood box. Nearly overflowing with gourmet goodness, it’s perfect for sharing with extended family and assembled friends during the holidays. 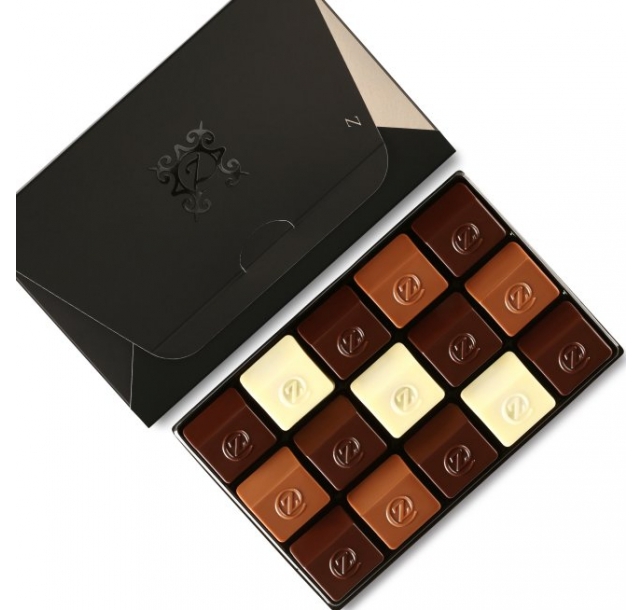 Description: Dedicated exclusively to the only chocolate worthy to be known simply as Z, this assortment is the perfect way to indulge in pure zChocolat goodness. Each piece is either a white, milk, or dark chocolate rendition of Pascal Caffet’s signature recipe and is bursting with salty-sweet caramel and rich hazelnut praline. A scrumptious solution for those times when you just can’t get enough of our most-famous flavor. 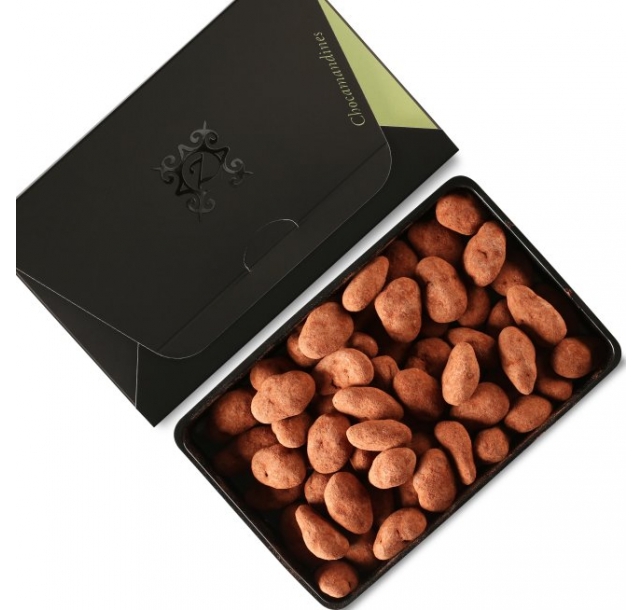 Description: Plump Valencia almonds from Spain have been roasted and drenched in intense Venezuelan dark chocolate to form the heart of this nutty confection. But what really sets our chocamandines apart is the Criollo dusting on the outside. Sourced exclusively from the Chuao plantation in Venezuea, Criollo is an intensely rich cocoa powder that takes chocolate flavor to a whole new level. Delightfully addictive, you won't be able to eat just one! Read more details on dark chocolate in our blog. Subscribe to our mailing list for the best coupon codes, products and deals.